Sometimes, you want to enjoy a nice glass of wine... but not the entire bottle! Cork it back up with one of these fabulous bottle stoppers. The corks are topped with fantasy figures, including gargoyles, castles, dragons and more! 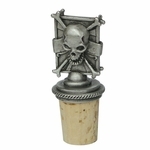 Pewter cork stoppers are made in the USA!